Homespun Stitchworks..... For the love of vintage: Designing Days ... Love them. On these rather cold and dark starts to the day I am loving slowly changing our home over to the cosy reds, creams and greens that the fairies seem to magically helping me with, little bits and bobs placed around. The house in December will be ready for Christmas and we will get our real tree about the second weekend of the month. Slowly though the transition has started in earnest. The fire is alight most of the days now when I am in and the frosty mornings I really love. That said I am so aware that I am a lucky lady who does not need to battle out in the freezing weather on icy roads and I know I am one of the very lucky ones. With my rough journal that I sketched and jotted ideas in I would like to transfer some in to my proper design journal and get some firm ideas underway. I love to doodle and paint a little and put notes in the margins for variations that may or may not be used. The fact is they are there and ready then for me to pick up to maybe start the paper patterns if applique is required, then all I have to do is make a project basket up ready just to pick up and start. I have started to get my designs ready for next years publications and I hope that the rest of this year will be kind and nothing else will happen to stop me in my tracks. 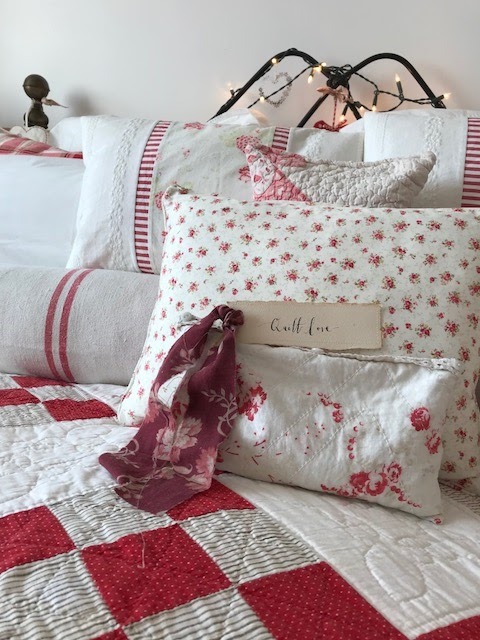 As you can see from the picture on the right our bed has started its transformation to Winter and the very old red and white quilt is on there and the vintage cushions all in reds and whites. All the bedrooms will be dressed with similar apparel, getting into bed here can be tricky for some ... I am so used to moving it all off for the night and then dressing it again the next day ... My husband is too he always says that it looks great and patiently waits for me to undress the bed before we climb in .. It just makes the bedroom look cosy and inviting and some days when I am tired it takes all my will power not to just climb on and cosy down for a nap!! As the transformation continues I will take a few photos for you. For now though I really must concentrate on actually doing some work. Have you noticed the skies of an evening lately they are pink and I remember as a child my Nonna saying it was a snowy sky .... Now am I wishful thinking? I would so love some snow for Christmas maybe Christmas Eve and wake to the silent white world after Santa has been. How magical would that be. The child in me is ever present and I think that is why I have such an imagination. I love that I still see the world that way. I have decided today I am going to sit by the fire and really try and get some Christmas trees stitched ready for the machine work at the weekend. Later I need to go through my red fabrics just to see because I had another idea the other day so I need to take stock to see if it is possible. I will tell you about that another day if it turns out that it can be done. Whatever you are doing today stay warm and cosy. I am lighting candles in a moment and then I will be having a warm drink with you all, then needles threaded and little stitches will begin. Have a great day and see you all back here on Thursday. Looks beautiful Sarah. Your hubby sounds so patient. Men don't seem to like scatter cushions on the whole. I'm really excited to see your trees and the needlecase as I know they will be stunning. Well thank you not sure about that (stunning)! But I will do my very best.